This week marks six months since the parliamentary vote that committed Britain to a new war in Iraq. British and US air strikes continue to take place on a daily basis though now virtually unmentioned in parliament and the press. In the past, national media poured over every detail of British military campaigns, evaluating progress, printing maps and eye-witness accounts, even having breathless reporters on the evening news counting aircraft out and counting them back in. In parliament MP’s questioned ministers and senior commanders in committee rooms while debating strategy from the back benches. By stark contrast today’s war in Iraq receives little such attention seemingly because it is being waged by strike aircraft and remote-controlled drones after politicians vowed not to deploy troops. With less ‘skin in the game’ it seems that war in Iraq is yesterday’s news. But careful and detailed scrutiny of our military operations by the press, parliament and the public is vital. Without it the disconnect between us and the wars being waged in our name grows ever greater. Even more importantly, the effectiveness of Western intervention has to be seriously questioned when the very rise of ISIS and the terrible destruction they are wreaking can in no small part be attributed to the last war in Iraq while the stark failures of interventions in Afghanistan and particularly Libya are there for all to see. In these circumstances for MPs to launch another war and then look away is scandalous. Currently the US and 16 allied countries have carried out over 2,900 air strikes in Iraq and Syria with the vast majority of these being undertaken by US aircraft. British Tornados and Reaper drones are carrying out around 8 air strikes per week, with the most recent figure given by the Defence Secretary of 170 air strikes up until 2 March. Britain’s air campaign has also crept, under the radar, into Syria with UK drones flying surveillance missions there despite the clear parliamentary mandate for military operations only in Iraq as the Defence Secretary publicly acknowledges. Compared to the large number of US missions being undertaken, British strikes are relatively small in number. They are however being undertaken at a much higher rate than the recent war in Afghanistan. For example the RAF has racked up 70 drone strikes in just under five months in Iraq where it took the them almost two years to notch up that number in Afghanistan. 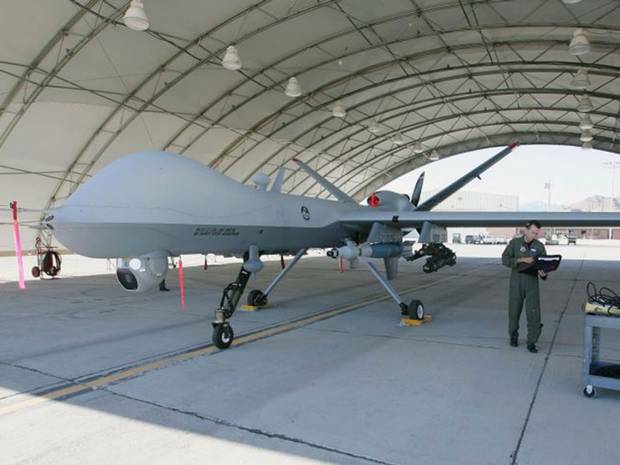 While the Ministry of Defence (MoD) also insists that its drones are “predominately used for intelligence, surveillance and reconnaissance (ISR) tasks” Britain’s Reapers are actually undertaking air strikes at a slightly higher rate than the Tornados. Tornados carried out 90 strikes in 22 weeks giving a strike rate of 4.09 per week, while Reapers have carried out 70 strikes in 16 weeks giving a strike rate of 4.37 per week. There are two broad categories of air strikes. Those that are launched against pre-planned targets as part of daily tasking order, known as ‘deliberate targeting’, and those that are launched ‘on the fly’ while the aircraft is in the air and with little or no forward planning, dubbed ‘dynamic targeting’. Inevitably strikes that are planned in advance are less likely to cause civilian casualties than those undertaken in the heat of the moment. Due to the absence of ‘boots on the ground’ and in particular the absence of Forward Air Controllers, the number of strikes that are dynamically targeted vastly out-weigh those that are pre-planned. US military sources told the New York Times in mid-November that only 5% of airstrikes in Iraq and 25% of strikes in Syria were planned in advance. The large number of such strikes being undertaken ‘on the fly’ inevitably leads to much greater risk of civilian casualties. Reports of civilian casualties in Iraq and Syria from coalition bombing have receive little attention so far. For months the US military insisted there had been no “valid” claims of civilian casualties from coalition bombing but after a change of stance in January the US said it would be examining some of the reports. Investigative reporter Chris Woods who has been tracking the air war in Iraq and Syria has recorded 37 separate ‘incidents of concern’ where air strikes have been alleged to have killed civilians. It is estimated that around 100 civilians have been killed in coalition air strikes in Syria and around 300 in Iraq but these figures are impossible to verify. Six months in to what is likely to be a long intervention, the lack of attention being paid to coalition bombing is a foreshadowing of things to come. For some time academics and commentators have been arguing that the changing nature of warfare – away from mass troop deployments to an increasing use of remotely controlled drones and special forces – will inevitably mean less scrutiny by the press, less oversight by legislators, and less control by the public. War being fought out of sight, disconnected from mainstream attention, commanded by a small group of insiders with little real accountability is a recipe for real disaster. Given the track record of our recent wars it is vital that there is more – not less – scrutiny and debate on the specifics as well as the overall effectiveness of such military operations. 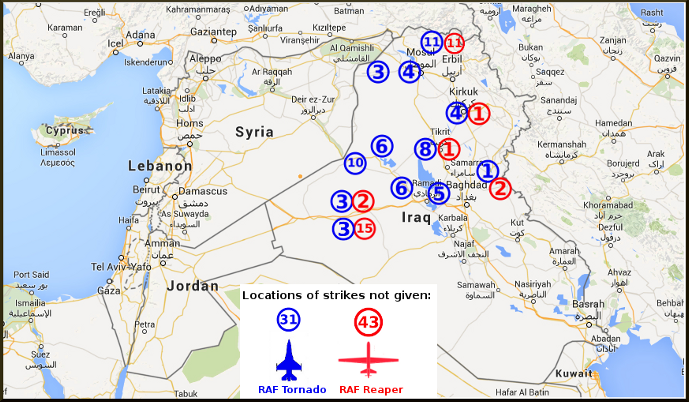 Feb 23 2015 Defence Secretary Michael Fallon: As of Sunday, we have conducted 152 air strikes in Iraq and deployed a range of aircraft to the region, including surveillance aircraft. Oct 21, 2014 UK announces Reaper and Rivet Joint aircraft will fly surveillance missions over Syria. Oct 12, 2014 Small number of UK trainers deployed to Irbil in Kurdish-controlled northern Iraq. Sep 13, 2014 Release of video depicting murder of British hostage David Haines. Aug 18, 2014 Defence Secretary Philip Hammond says no plans for air strikes “We will if requested provide support to the Iraqi government, but the Prime Minister has been very clear that this is not about getting dragged into a war in Iraq, we will not be putting combat boots on the ground. [T]here’s no call for us to deliver air strikes at the moment. The US is delivering targeted air strikes, and they’re perfectly able to do what needs to be done, so we have no plans at the moment to engage in air strikes.” Later it was insisted he only meant Syria but he clearly states ‘Iraq’. Jun 16, 2014 UK Foreign Secretary William Hague makes statement to House of Commons on situation in Iraq saying UK is taking action in three areas; promoting political unity, offering assistance where possible and alleviating humanitarian suffering. “We have made it clear this does not involve planning a military intervention by the United Kingdom” he states. Jun 10, 2014 Iraq declares state of emergency after ISIL takeover of Mosul. ‹ Drones aren’t just annoying toys. They’re still killing people too.